In 2013 UC President Napolitano declared that UC will be the first research university to achieve carbon neutrality, with a target date of 2025. Since 1990 UCLA has grown almost 40%, adding nearly eight million square feet to the campus footprint, the equivalent of over 4,000 houses. Over the last two decades UCLA research awards and grants have exploded from less than $300 million to over one billion dollars annually. One would expect with such remarkable growth to see a parallel increase in greenhouse gas emissions. 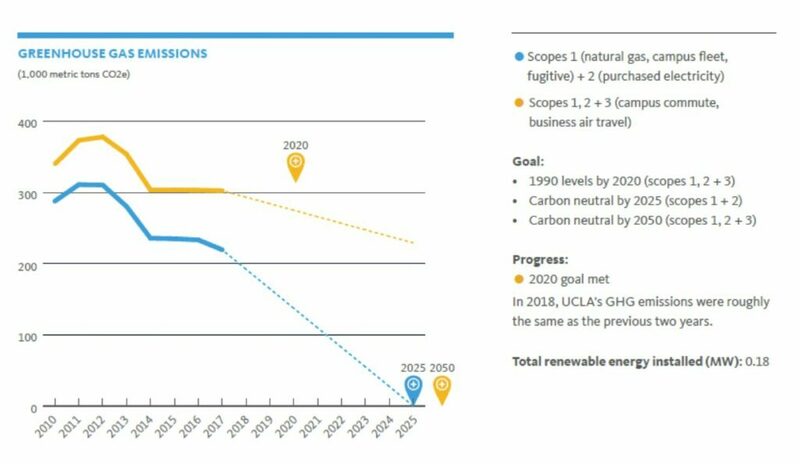 Yet through a combination of energy efficiency, renewable energy, sustainable transportation programs and offsets, UCLA reduced greenhouse gas emissions to below 1990 levels in 2014, achieving the 2020 goal six years ahead of schedule. A focus on energy efficiency allows UCLA to reduce its emissions in a financially feasibility way. For more detail and a current list of energy initiatives click here. The university continues to grow and UCLA is in the process of developing a Carbon Neutrality Plan. To get to neutrality in 2025, in addition to deeper energy efficiency, will require increasing on site biogas, purchasing green energy, and offsetting the remaining emissions.